Public fears over young people carrying knives in school and on the street could prompt new government restrictions, the Home Office says. Home Secretary David Blunkett and Education Secretary Charles Clarke are considering moves to combat the proliferation of knives. They include raising the age at which teenagers can buy a knife to 18 and introducing searches in schools. The age limit would bring knives into line with fireworks and alcohol. The Home Office said there were 272 homicides involving a sharp instrument in 2002/3 out of a total of 1,007 - up 4% on 2001/2. In November 2003, 14-year-old Luke Walmsley was stabbed to death at the Birkbeck School in North Somercotes, Lincolnshire, by a fellow student. The government is working with the police to find out the extent of knife crime and strengthen the law. 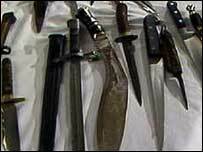 Mr Blunkett said there was a "strong argument" for having to be 18 to buy a knife. The education secretary is looking at giving head teachers new powers to search pupils, rather than waiting for police to do so. He is also considering setting up agreements between heads and police to let them request unannounced police searches in schools to detect and deter knives.